The people who have produced the video below deserve a round of applause for making the subject of smart meters (which admittedly can be quite dry unless you are a technie) actually entertaining! 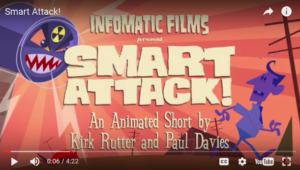 Even if you think you already know all about smart meters, this is a video worth watching. However, given that if you accept a smart meter, you have no control over how often it will transmit, the easiest way to protect yourself from the potential risks to your health, privacy and finances explained in the video is to say NO to a smart meter.